Wild: Coelacanth nutritia is one of the few creatures on the island with a relative that can be found back home. The Coelacanth lives in the waters around the island, as well as the rivers and lakes within the island. Unlike most Coelacanth, Coelacanth nutritia meat contains less oil and urea. In fact, it is one of the healthier sources of meat on the island. Domesticated: While Coelacanths cannot be tamed the way most creatures on the island can, they provide a possible source of meat for coastal tribes that have the time to catch them. 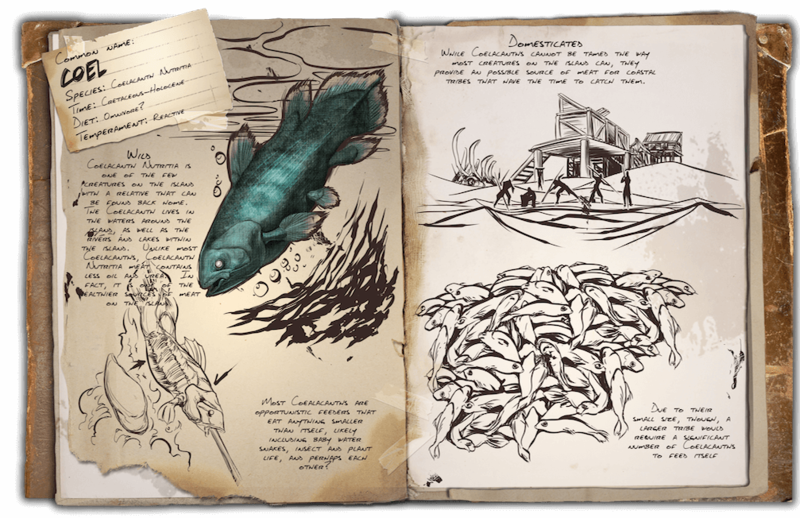 Known Information: Most Coelacanths are opportunistic feeders that eat anything smaller that itself, likely including baby water snakes, insect and plant life, and perhaps each other?